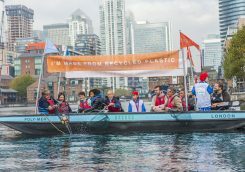 Last February, Jericho co-founder Christine Armstrong organised for her kids’ school Canary Wharf College to start plastic fishing on London’s Docks. The project was inspired by the work of PlasticWhale and Marius Smith in Amsterdam. It was designed to tackle the problem of plastic litter in the Docks, which is especially troubling in Spring when many birds nests are almost completely made of packaging. The project takes local school children, from primary age upwards, out on boats with fishing nets and grabbers to catch the plastic. 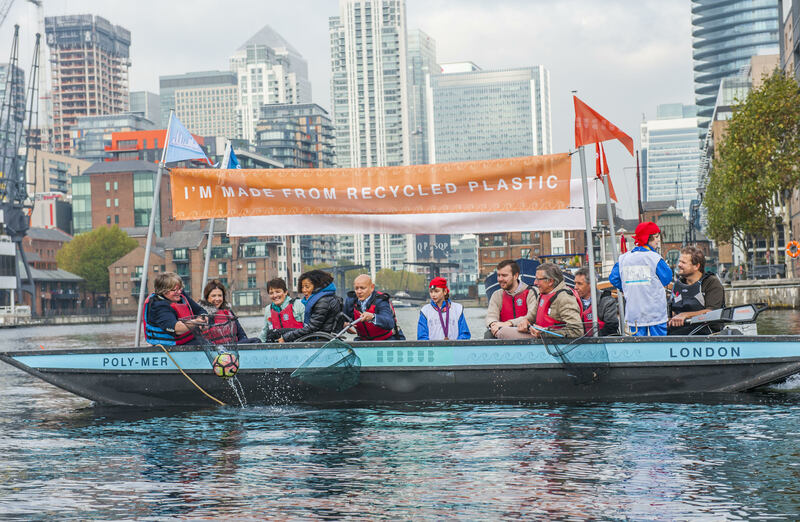 Last week, the school and environmental charity Hubbub, launched Poly-Mer, the first boat in the UK made from 99% recycled plastic waste, which will enable much more plastic fishing. The 12-seater punt is made from Plaswood, which is made of 100 per cent recycled, single-use plastic, using traditional boat-building techniques. The boat was made by Richmond-based master boat builder Mark Edwards MBE, who also made the Queen’s barge Gloriana. While we might concede that Gloriana was pretty prestigious, Mark was very excited to combine his interest in sustainability with old-fashioned boat-building techniques. The boat was supported by Sky’s Ocean Rescue. Having a dedicated boat – designed to fit under the low bridges of the Docklands – will enable more local children to see the big difference they can make in a hour of cleaning up. It also raises their awareness of the issue. Each year 300 tonnes of litter is cleared from the Thames, and yet much more rubbish remains in the water and gets washed out to sea. 70 per cent of fish living in the Thames are found to have plastic in their gut. Some eight million tonnes of plastic enter the oceans each year, most of which is originally discarded on land, finding its way into the sea via rivers like the Thames. Our goal is to reduce the amount of plastic washed into the river in the first place. The boat is now available for corporate hire for plastic fishing trips. If you want a team building or environment project to join, let christine.armstrong@jerichochambers.com know. Watch a video of the launch below. The below clip from ITV London’s coverage of the launch describes a bit more about the construction process. The project is part of a wider push to adopt cradle-to-cradle approaches to production, promote understanding of the circular economy and – perhaps most importantly – give people the opportunity to actually practically do something to solve environmental problems affecting us all. Plastic fishing trips take place Monday – Friday at Docklands Sailing and Watersports Centre, E14. A full write-up and video blog of the initiative so far – from its inception to the launch of Poly-Mer – is available here.